I'm down to my last 24 hours or so in Hawaii. For now, anyway. People are super nice in Hawaii. I went to the North Shore today. Honolulu's transit, called "The Bus," goes all around Oahu. Going to the North Shore took 2 hours, but only cost $2.50 (or in my case, since it worked out that a monthly pass for $60 for the 8 days I'm in Honolulu was cheapest). 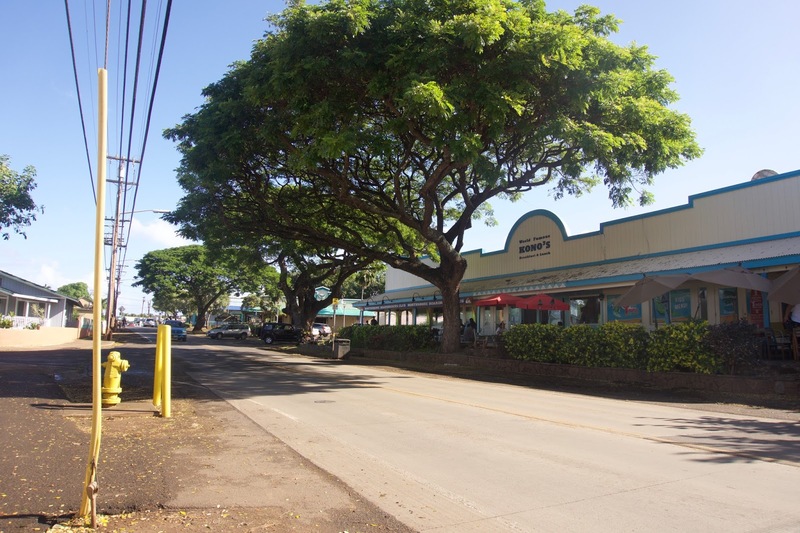 Haleiwa, Oahu, Hawaii, on the King Kamehameha Highway. Oahu's version of the country, I'm told. It rained on and off when I was at the North Shore, but back in Honolulu for the afternoon and it rained the whole evening and night. No lie, I acclimated to this weather pretty quickly. The whole day on the North Shore, I was wishing I had more than a tank top and shorts. It was maybe mid-20s celsius. Tonight, it was raining and windy. 21 degrees celsius, and I had to come back to the hotel to get pants and a hoodie. Going home will shock my body, I'm sure. The thing is, the day I left Toronto, February 1, was in the mid-teens, so no word of a lie, in my head, it should be summer because I had spring, if even for a day, and had had winter in mid-January. So for awhile, I kept thinking it was July and the news saying it was February was confusing. Winter will be weird when I get back. 1) Hawaii is laid back. Formal attire is an aloha shirt and nice pair of pants--not dress pants or jeans. I was looking at an aloha shirt in a store, and no kidding, the salesperson asked me if I was looking at them for a special occasion. And don't bring jeans. Too hot. 2) If you think you packed too much, you probably have. I could have gotten by on two pairs of shorts, but I brought three, for instance. You might need specialized stuff, like stuff for hiking or snorkelling, if that's your thing, but otherwise, no need. 3) The best purchase I made, by far, were my board shorts that look like shorts. As advertised on its sales tags, it goes from the beach to dinner with your bros. And it does. It has zipper pockets. You can throw your wallet, or a bare collection of cards and some cash you need for the night, into an waterproof plastic bag (I bought these things for that purpose at hiking store that was like a ziploc but with stronger plastic and double sealing zippers), and your set for a quick dip in the pacific and for a night out. 4) If the no shirt, no shoes, no service rule were strictly enforced here, no restaurants would make money. For real, I was at a restaurant, the cheaper side ($18 for a complete dinner, no drink), greasy spoon type place, but Hawaiian, and for real, a dude wasn't wearing a shirt. No one was saying anything. 5) I can't emphasize how important it was for me to always have the board shorts on, a towel in my bag, and water protection for my wallet, so I could go into a body of water at any time. It's pretty awesome. 6) They're not "sandals" here; they're "slippers." And they are acceptable in all restaurants, except the most formal ones. I'll finish this list later. I'm sure there's more. Tomorrow is my lounge and chill day, soaking up my last hours here. Flight leaves at 11:30 PM HAST, so I have time to hang out for sure.